We strive to prevent illness whenever possible, and routine vaccinations are an important of this. 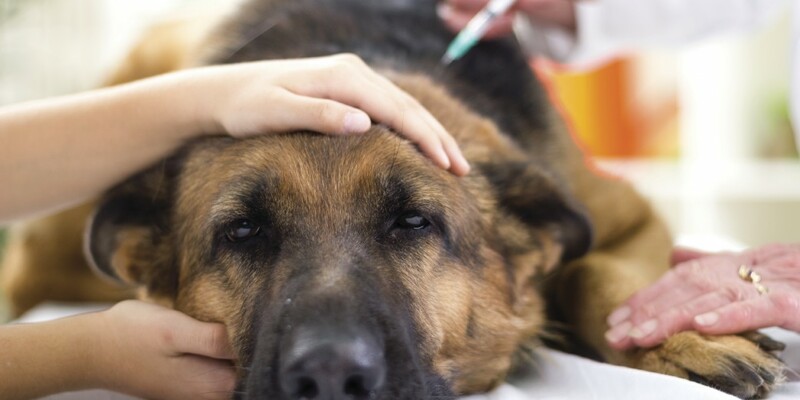 Because of the severity and contagious nature of some diseases, certain vaccinations are considered “Core”- meaning they are recommended for all pets at all lifes tages. Other vaccines are considered “lifestyle” vaccines, and are commonly recommended based on a pet’s likelihood of exposure to the disease. At your next exam with Dr. Grossbard you can discuss what vaccinations are ideal for your individual pet. Rabies Vaccine (Core)– Rabies is a virus spread through animal bites. 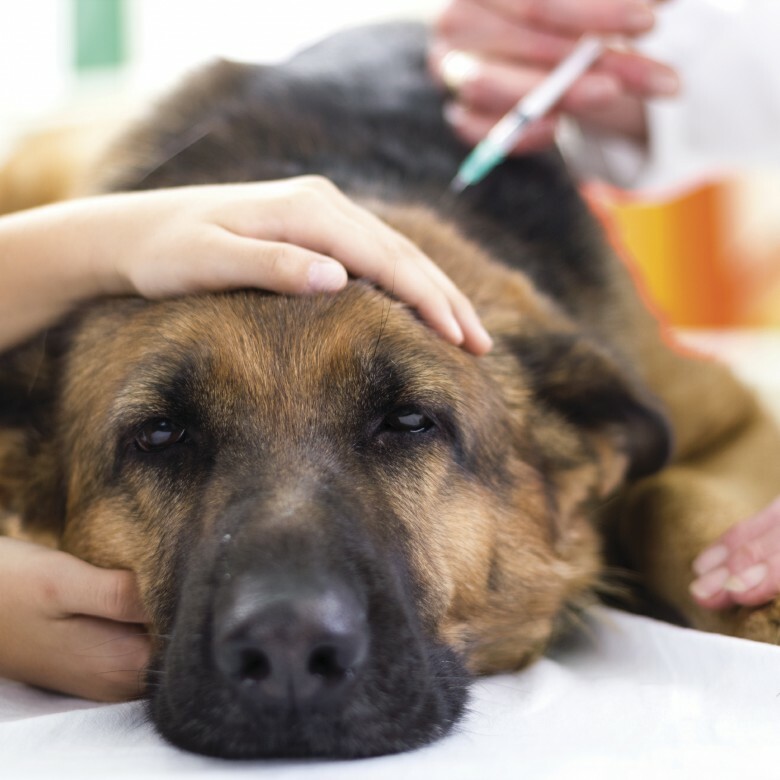 Because rabies is 100% fatal in cats and dogs and almost always fatal in humans unless treated immediately, the rabies vaccine is legally required for all dogs in San Mateo County. The first rabies vaccine is good for one year puppy and then given every three years thereafter. DAPP (Distemper, Adenovirus 2, Parvovirus, Parainfluenza) (Core)– DAPP is a combination vaccine that prevents multiple potentially fatal diseases. Distemper and Parvo are dangerous to dogs at all life stages, but puppies and unvaccinated dogs are at the highest risk. The DAPP vaccine is given as a series of 3-4 as puppy, once a year later, and then every 3 years as an adult. Bordetella (Lifestyle)- Bordetella is the most common cause of contagious upper respitory infections. It is spread through dog to dog contact and can be easily spread in boarding facilities, doggie daycares, groomers, training facilities, and other locations where multiple dogs meet. The bordetella vaccine needs to be boostered 3-4 weeks after the first injection and then every year after. Canine Influenza (Lifestyle)– As the name suggests, there are two strains of influenza specific to dogs. It was first diagnosed in the Bay Area in 2018, and due to the lack of previous exposure spread quickly. Like the bordetella vaccine, canine influenza is recommended for dogs that spend time in close proximity to other dogs. The vaccine needs to be boostered 3-4 weeks after the first vaccine and then once a year after. Leptospirosis (Lifestyle)– Leptospirosis is a bacterial infection spread through water contaminated by wildlife urine. This disease can be spread to humans. With the increased rainfall in California, there has been an increase in cases of lepto in dogs. The lepto vaccine is recommended for dogs that swim, hike, drink puddles, or if there is a known rodent or wildlife population around your home. The vaccine needs to be boostered 3-4 weeks after the initial vaccine and then annually. Lyme Disease (Lifestyle)– Lyme is a tick-borne disease that can cause long term health concerns for pets and people alike. The lyme vaccine is recommended for dogs that like to hike or spend time in tall grass. The vaccine needs to be boostered 3-4 weeks after the initial vaccine and then one a year. FVRCP (Core)- FVRCP is a combination vaccine that prevents against three potentially deadly viruses: rhinotracheitis, calicivirus and panleukopenia. Because these can be airborne, they are recommended for all cats. Kittens get the vaccine 3-4 times then once a year later and every 3 years after that. Rabies Vaccine (Core/Strongly Recommended)- All cats that spend any time outdoors should be vaccinated against rabies. Indoor only cats are also advised to receive the vaccine in case they ever go outside or come into contact with a rabies vector. (Wildlife that enters the home areas, such as bats.) Some towns require cats to be licensed, and therefore do need the rabies vaccine. Feline Leukemia (Core/Strongly Recommended)– Feline leukemia is a retrovirus spread from cat to cat via saliva and nasal secretions. This vaccine is highly recommended for multi-cat households or outdoor cats that may interact with other cats. This is an annual vaccine. In some instances, titer tests, or bloodwork can be done to determine a pet’s immune response to the infections we vaccinate for. 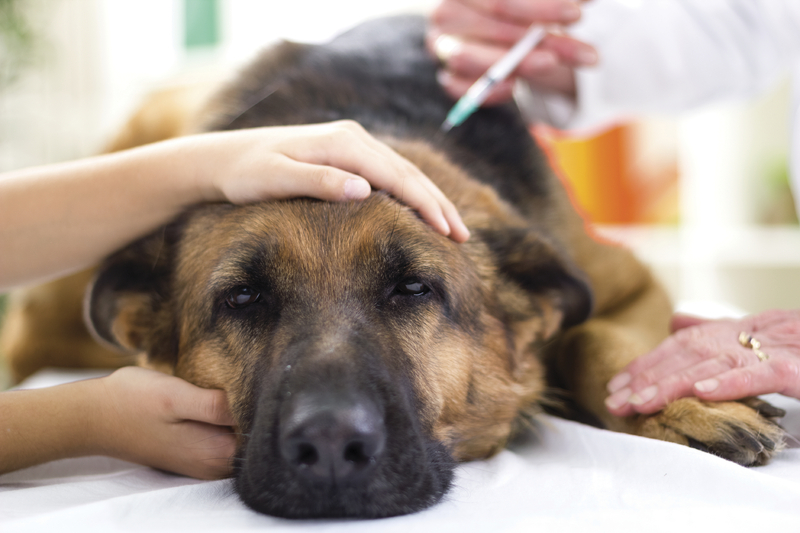 Titers may be an option for pets that have previously had adverse vaccine reactions. In addition, Hawaii and some countries may require rabies titer before travel.